By combining convection heat, impingement air, and microwave energy, the Merrychef eikon e4s high-speed oven can prepare foods up to 15 times faster than conventional ovens. The unit serves as the perfect solution for those who wish to equip their convenience store, fuel station, snack bar, and break room with the ability to produce great-tasting, hot food fast. An easyToUCH™ icon-driven touch screen offers intuitive control of the unit, while multi-stage programming is available with up to six stages, each with its own time, microwave power, impingement settings, and between stage instructions. This item is a recipient of the Kitchen Innovations® Award. Given annually by the National Restaurant Association, this award recognizes items that have made a meaningful impact in the foodservice industry. This unit comes with a NEMA 6-30P plug. For further customization, a USB memory stick allows the user to upload and download up to 1024 new programs with custom pictures. Built-in diagnostic testing and quiet operation ensure this microwave provides years of long-lasting, functional, and practical use. Stainless steel construction adds durability, and an easy-to-clean cavity helps prevent maintenance time and costs. 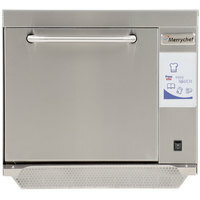 The Merrychef eikon e4s rapid cook oven requires a 208/240V electrical connection. Its built-in catalytic converter allows it to be operated without a venting system. Removable internal and external air and grease filters help to maintain the performance and cleanliness of the unit and its surrounding area. This helps to save energy and reduce noise. 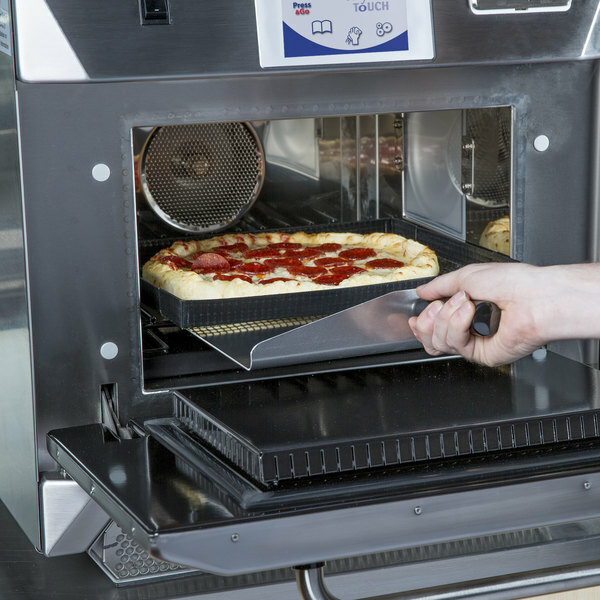 Because of its ventless design, the oven is easy to place in your kitchen, as it doesn't require a hood for operation; however, as local codes may vary, please contact your local regulatory authority to confirm that ventless operation is permitted. 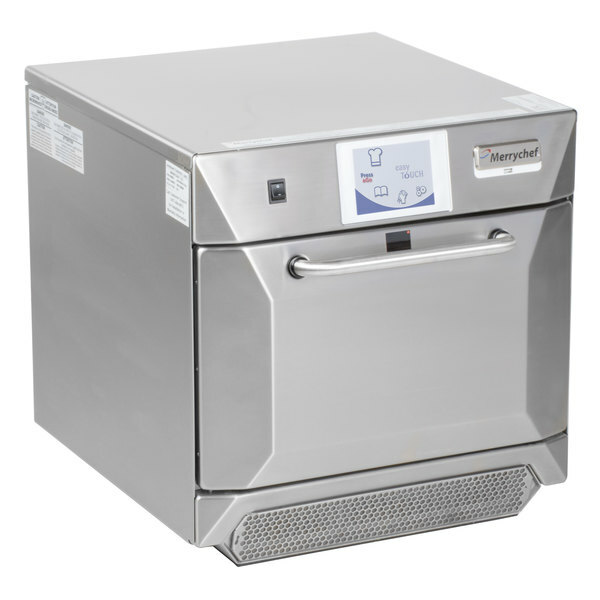 The stainless steel, 14 3/16" x 14 3/16" cooking cavity ensures you have plenty of food to cook delicious and fast meals for your patrons. A standard metal baking pan may be used in convection mode. Plus, it can hold up to two standard quarter size food pans or a round turntable that facilitates even faster and more efficient cooking! 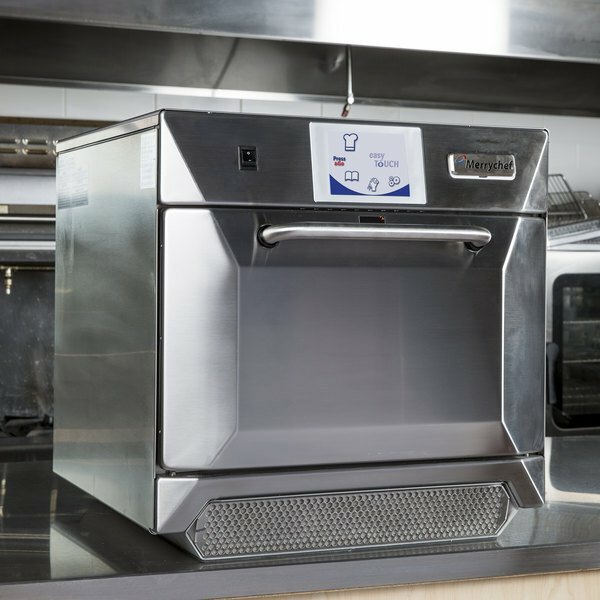 When finished, the stainless steel body and interior are easily cleaned with ChemcoDB-C Dirt Buster III oven cleaner and ChemcoOS-C oven shield. Other features include ventless operation, easy-access front monitored air filter, integrated oven cavity overheat protection, and a cool-to-the-touch door exterior. A convected heat power output of 3200W heat temperature range of 212 to 527 degrees Fahrenheit means this versatile microwave can accommodate a wide variety of dishes and platters. This unit includes a shelf rack, cool down pan, pizza paddle, and two bread baskets. 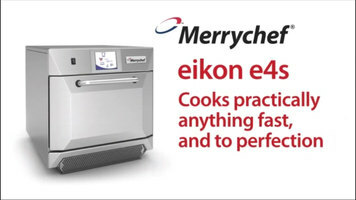 Watch this video to learn how to keep your Merrychef eikon e4s combination oven clean! Want to increase your cooking times and menu flexibility? Watch this video to see how the Merrychef eikon e4s can help you do both! 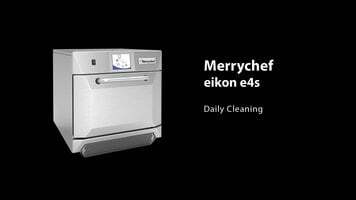 This video explains the daily cleaning process of the Merrcychef eikon e4s. You will need gloves, safety glasses, and Merrychef oven cleaner spray. First, cool down the high speed oven. Place a tray of ice in the high speed oven and press OK on the screen. The oven will cool down. Next, the screen will prompt you to clean cavity. Put on the protective gloves and remove tray from the high speed oven. Then remove high speed oven parts. Clean high speed oven parts either by hand or in the dishwasher. Put on the protective glasses and remove spillages and food particles with a cloth. Spray cleaner onto a sponge and clean the cavity, roof, and inside the door. Avoid putting cleaner into the door seal and avoid scrubbing the door seal or using metallic scourers. Wash off the spray with a wet cloth then wipe dry. Once dry, replace high speed oven parts. Apply protector onto clean sponge and wipe down roof and cavity. Avoid putting protector onto the door seal. Once protector is applies, replace the tray. Press the green check mark on screen to confirm you have applies oven protector and then remove, clean, and replace the air filter. The air filter slides out of the back of the unit. Pull out the drawer from the bottom of the unit as well. Thoroughly clean both with cloths. Then replace the filter and the drawer once they have been cleaned. Clean the exterior of the unit with a cloth and then press the green check box to confirm you have replaced the air filter. The unit will then power down. Then, preheat the oven and let the protector cure for 30 mins. Daily cleaning will then be complete. The Merrychef eikon e4s cooks practically anything fast, and to perfection. Why chose the eikon e4s? 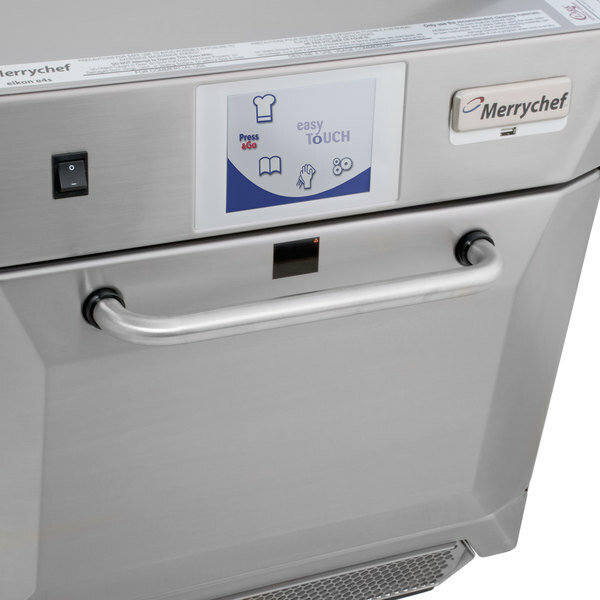 Ultimate menu flexibility, 15 times faster than conventional cooking methods, icon-driven touchscreen controls reduce training times, and consistent unbeatable results. 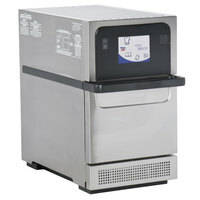 The e4s allows you to cook food to order to reduce waste. It minimized lifetime operational costs by using a built in diagnostics to reduce downtime and service calls. 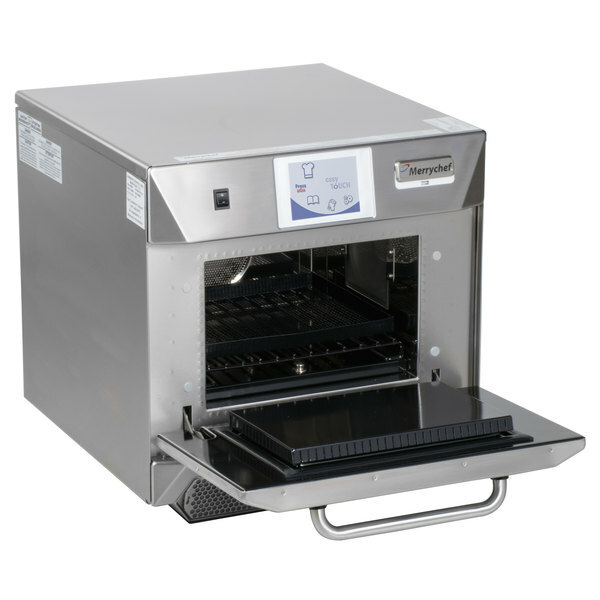 A built in catalytic converter eliminates the need for a ventilation hood. The energy saving standby mode saves money during idle periods. easyTouch touch screen technology eliminates language barriers, minimizes training time, errors, and waste by using an icon-driven interface. Pre-program up to 1024 multi-stage recipes for consistent and repeatable high-quality results. Upload new menus easily using Merrychef's unique MenuConnect and a USB drive. 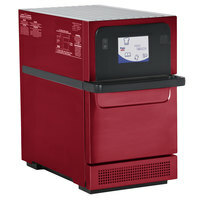 Eikon e4s energy efficient rapid cooking oven cooks food 25% quicker, 50% quieter and is now able to cook a 14" pizza. The e4s combines 3 technologies: microwave, high speed convection, and impingement. This results in 15 times faster than conventional cooking methods because of the use of optimized air flow. For example a 12" pizza cooks 25% faster! A toasted sandwich cooks 25% quicker. A portion of potato wedges is now 25% quicker. Ideal for service restaurants, convenience stores, supermarkets, hotels, schools, and universities.